This is not your usual technical article on seaweed biochemistry or biology. This topic is quite different. It is the untold tale of discovery, repeated thousands of times around the world by scientists from all disciplines. It is the chase, the hunt for something new, something useful. Starting with a hunch, proving an idea and fulfilling the passion are all the ingredients that make scientific discovery a unique experience. And this story is not about me. This story is about Sister Avelin Mary, a Roman Catholic nun, a marine scientist of India and her relentless effort to find seagrapes, a strange, odd-looking seaweed considered by experts as ‘extinct’ in Indian waters. For thousands of years, seaweed has been harvested from wild beds and some cultivated artificially for food, primarily in Asia. It is only in the last century that a portion of the world’s seaweed harvest has served as natural resource for ingredients used in cosmetics and other industries. This nonfood use has great potential. Just as an example, a recent paper in Science described the use of engineered microbes to convert brown seaweeds (kelp) into biofuels. Seaweeds produce two times more ethanol than sugar cane and five times that from maize given the same area of cultivation. Given the increasing demand and great interest for new ingredients derived from the marine environment there has been a flurry of research to identify new seaweed resources. However, harvesting from the wild is a problem, partly because the ingredients derived from them may vary from one season to the next. Moreover, companies are wary of using resources from wild harvest since they can be affected by seasonal fluctuations of availability, quality, pollution and over-exploitation of sensitive marine habitats. The cosmetic industry, in particular, looks for marine resources that have both a great marketing story and renewable through artificial methods called mariculture. Anyway, that was my ‘scientific’ excuse for initiating a worldwide search for new exotic seaweeds. But beyond the science and the capitalistic expectations, there is always a thrill in the hunt. Sister Avelin Mary, the heroine of the tale, and I always refer to such scientific adventures as ‘treasure hunting’ (in a biological sense). Sister Avelin is a marine biologist and a Roman Catholic nun belonging to the Congregation of the Mother of Sorrows Servants of Mary. After her PhD in zoology, she went on to do her post-doctoral work at Osborne Laboratories (New York Zoological Society) and Duke University Marine Laboratories (Beaufort, North Carolina). She returned to India to establish her own independent research group in 1988. Established in the port city of Tuticorin and with permission of the Mother General of her Congregation, this nonprofit research institution, called Sacred Heart Marine Research Centre (SHMRC), became one of the premier marine science research centers where Sister Avelin studied the biology of barnacles . Why of all things barnacles? That was her area of training and focus of interest while at Duke University and the research program was conceived at the time when there was an urgent need to find alternatives to the toxic tributyl tin (TBT) widely used in marine paints to prevent barnacles from attaching. TBT is a nonspecific organotoxin and among the most toxic man-made chemicals in use. It kills all marine life on contact! She identified one such non-toxic natural anti-barnacle chemical from soft corals called Juncellin, named for Avelin and the octocoral, Juncella . My collaboration with Sister Avelin began in 1994 and continues today, the longest, productive and continuous scientific collaboration Poseidon Sciences ever have had. In 2007, I posed the question to Sister Avelin about the presence of Indian seagrapes (Caulerpa lentillifera), a unique edible seaweed delicacy grown in Okinawa. It is found mostly in the Pacific Rim and commonly referred to as sea caviar, as nama in Fiji, as lato in Philippines and umi budo in Japan. 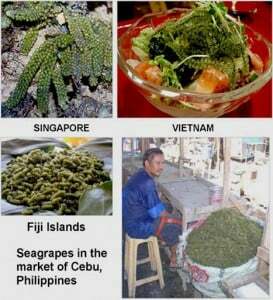 Highly priced as a delicacy, seagrapes really are succulent miniature grape-like seaweeds. Upon biting on the seagrapes, the salty interior bursts in your mouth. However, this marine plant is seasonal and available only during the dry season. This seaweed requires normal seawater salinity to grow and die when salinity drops during the rainy season. SHMRC’s research site in Tuticorin (Tamil Nadu, South India) is ideal for cultivating the seagrapes since it has two short monsoons, not in the path of cyclones, with stable salinity and temperature year round. I thought seagrapes ought to be naturally occurring along the coast of India. This question led us through several years of an exciting quest and I would like to share this story with you. There was a 2004 article by Mantri  that described seagrape found in the Gulf of Kutch on the northwest coast of India. However, the discovery was not well received by the experts in marine botany who suggested that it was merely an error in identification. Further literature research on the topic indicated that seagrapes, for reasons unknown, had been declared extinct in all of India for over half a century, according to the experts. The last survey showing presence of seagrape beds was in 1955 and subsequent surveys yielded no specimens . We consulted botanists and was told not to waste our time looking for it. India has a vast coastline. We could not imagine that the ‘experts’ have explored all of its 7,517 km coastal zones exhaustively to make such a definitive declaration of extinction. And, as we have seen in the last decade, other species once thought extinct, seems to turn up all the time, found accidentally or through sheer persistence. Take for example the story of the Hula Painted frog that was also declared extinct 50 years when its swamp habitat was drained totally to get rid of malaria in the Hula Valley of Israel. Rehydration of the swamp brought back the species. Another example is one species of giant Galapagos tortoise, Chelonoidis elephantopus, once declared extinct for the last 150 years and just recently found again. There are many more examples just in the last year alone. So, we thought it is just a matter of looking hard enough for the ‘treasure.’ All we need is some luck and determination. We decided on a hunch that it is not extinct and that maybe seagrapes were just simply hard to find. 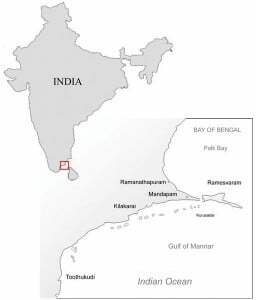 The last known location of seagrapes was in Krudasai, just about 100 miles in front of our marine station in Tuticorin. However, the site has long been converted to a protected marine reserve and off limits to harvesting of any organism. Beyond the reserve is a vast area and we have sent divers to search beyond the exclusion zone. Seagrapes can survive in a wide range of habitats, from rocky subsea outcrops to muddy-sandy substrates where it attach. Our own surveys covered a wide area from Tuticorin (Toothukudi) to Mandapam. Months of treasure hunting yielded nothing! It was like looking for the Titanic without the benefit of sonar and a GPS unit. Our broad, methodical sweep, looking for a natural bed of seagrapes was a failure. But, Sister Avelin, one of the most optimistic people I have ever known, persisted onwards. In an India Today magazine article, she said that “there is no magic in the world [of science] except the magic of hard work.” That very much sums up Sister Avelin. Then came the hunch–the seagrape bed still exists; it is simply not accessible and that fragments wash out of the bed during monsoons, some of them spreading to the shore. We thought it is was a wild hunch, but Sister Avelin was persistent and thought that it was worth one more try. This time, instead of looking deep underwater, we simply instructed harvesters to take a few kilogram samples from near shore beds of seaweeds and bring it to the lab. At the same time one of our company’s biologists from Athena Biosystems in the Philippines, Araceli Q. Adrias, went to India to help sort and identify the seagrapes from the mass of mixed species of harvested seaweeds. Sorting the seaweeds manually to identify fragments of seagrapes (top left), Seagrapes found compared to mass of other seaweeds collected from near shore (top right), an entire fragment of seagrape (bottom left), close up look at a single ‘grape’ and a schematic of the grapes on a branch (bottom right). And, indeed the wild hunch paid off! After hours of exhausting work, we found 16 grams of pure seagrapes embedded in the mass of other seaweeds, such as C. racemosa (a related species with almost similar physical characteristics), C. sertularioides, Enteromorpha flexuosa and C. peltata. Our seagrape collection represented less than 0.01% of the total mass collected from the near shore. With much effort and overcoming the objections of other marine botanical ‘experts,’ the seagrape manuscript describing the find was published in 2009 . This Indian species represents a new sub-strain; smaller ‘grapes’ and more spaced than typical specimens found in other countries. And, yet tastes just like the Okinawan variety too! Young shoots of seagrapes on the palm (top left), growth pattern of cultured seagrape showing 15 days doubling time in mariculture (top right), raceways used for artificial culture (bottom left), Sister Avelin showing the harvest from one tank after months of culture using the 16 g collection as starting point (bottom right). Certainly the find is of significant academic interest but not enough was collected to be of practical use. We asked, “Can we culture the seagrape we collected?” Within six months, Sister Avelin’s team artificially grew those 16 grams to a mass of over 12 kilograms. With a doubling rate of 15 days, it is possible to build an entire mariculture program to support a new industry using land-based culture technologies we now refer to as the Javelin Mariculture Program. This natural, sustainable approach is one that can supply vast amount of seagrapes for food and industrial applications. Why culture this seaweed on land in seawater tanks and raceways? This approach represents an opportunity to grow pure strains of the seagrapes under controlled conditions on a year-round basis that maximize production of the required active ingredients. Mariculture also makes it possible to make productive use of non-arable sandy coastal zones and avoid the need to harvest from the wild, thereby protecting the fragile marine ecosystem of the Indian coastal zones. And, more importantly, one will avoid the temperamental sea that can easily destroy man-made structures on the sea surface or below. The senior research team: Jonathan R. Matias (top left), Sister Avelin (top right), Araceli Q. Adrias (bottom left), and Sister Vitalina (bottom right). Seagrapes have already been shown to have higher absorptive capacity compared to activated carbon. It has anti-oxidant, anti-viral and anti-cancer properties! [6.7.8.9.10]. Ongoing research is yielding interesting findings that will have unique applications in cosmetics. It offers a unique opportunity to formulators for an ingredient that is natural, sustainable, reproducible and rare. With a renewable, secure, year-round supply, Sister Avelin’s seagrapes, she prefers to call in Tamil as kadalthiratchai, may soon yield new and exciting products for cosmetics and other industrial applications. Our ‘treasure hunt’ at sea continues.…. Mary, A. Sr., Mary, V. Sr., Rittschof, D. and Nagabhushanam, R., Bacterial barnacle interaction: potential of using Juncellins and antibiotics to alter structure of bacterial communities. J. Chem. Ecol., 1992, 19(10): 2155-2167. Mantri, V. A., Current Science, 2004, 87, 1321-1322. Chacko, P. I., Mahadevan, S. and Ganesa, R., Gulf of Mannar Contrib., Marine Biological Station, 1955, pp 1-16. Mary, A. Sr., Mary, V. Sr., Lorella, A. Q. D. and Matias, J. R., Rediscovery of naturally occurring seagrape Caulerpa lentillifera from the Gulf of Mannar and its mariculture. Curr. Sci., 2009, 97(10): 1418-1420. Pavasant, P., Apiratikul, R., Sungkhum, V., Suthiparinyanony, P., Wattanachira, S., Marjaba, T. F., Bioresour. Technol., 2006, 97, 2321-2329. Barbier, P., Guise, S., Huitorel, P., Amade, P., Pesando, D., Briand. C., Pevrot, V., Life Sci., 2001, 70, 415-429. Ara, J., Sultana, V., Qasim, R., Ahmad, V. U., Phytother. Res., 2002, 16, 479-483. Ganesan, P., Kumar, C. S., Bhaskar, N., Bioresour. Technolo., 2008, 99, 271-273. Nicoletti, E., Della Pieta, F., Calderone, V., Bandecchi, P., Pistello, M. Morelli, I., Cinelli, F., Phytother. Res., 1999, 13, 245-247.